North Korea’s burgeoning nuclear program is placing greater demands on US extended deterrence and also raising questions in Seoul and Tokyo about the robustness of US commitments. These challenges are likely to grow over the coming years, as North Korea appears poised to expand the quantity, quality and diversity of weapons systems in its arsenal in potentially dramatic ways. Keeping up with the requirements for extended deterrence and assurance is likely to test US policymakers and military planners for the foreseeable future. Failure to manage related challenges could have far-reaching strategic consequences. This paper explores the geostrategic implications of a nuclear-armed North Korea—specifically, the challenges for extended deterrence and alliance relations—and the impact of alternative North Korean nuclear “futures.” First, it reflects on a more general debate about whether nuclear weapons reinforce deterrence relationships or embolden aggressive behavior, and what we might expect from North Korea as its nuclear capabilities grow. While it is impossible to know whether and how Pyongyang’s foreign policy would change, there are legitimate reasons for concern. The paper then discusses extended deterrence and assurance challenges in East Asia. It concludes with a discussion about the impact of different North Korean nuclear developments on those challenges over the coming years. 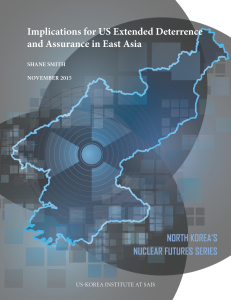 Download the report, “Implications for US Extended Deterrence and Assurance in East Asia” by Shane Smith.